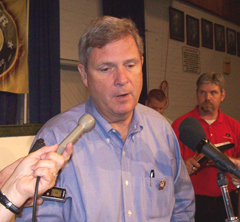 U.S. Ag Secretary Tom Vilsack held a "town hall" meeting at the Iowa State Fair this morning and fielded just one question about health care reform. The rest focused on ag-related policies. Vilsack, the former Iowa governor, promised the crowd the U.S.D.A. is doing what it can to help struggling pork and dairy producers. "This is real. The pain is real," Vilsack said. "The stress and difficulty is real." 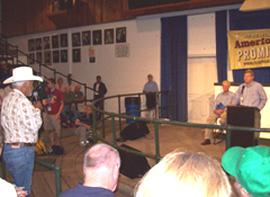 A crowd of about 200 sat on wooden bleachers as Vilsack spoke from the center of a show ring on the fairgrounds. Vilsack told the crowd he’s directed the Farm Service Agency to work with financially-strapped farmers who are finding it difficult to make their loan payments. "If we have to reduce an interest rate, if we have to maybe reduce a principle amount, let’s refinance, let’s restructure the loans that we have control over, that we directly lend to the farmer and that is now in the works," Vilsack says. "We sent a letter to every borrower. We sent a letter to our Farm Service folks and we basically said: ‘Work with these folks.’"
Vilsack said he will meet, by phone, next week with executives from all the commercial banks that offer ag loans that have been guaranteed by the U.S.D.A. According to Vilsack, that portfolio is "thousands and thousands and thousands" of loans. "And while we can’t force them to do this, we are going to jawbone them as best we can to explain to them it doesn’t do them any good to lose a customer," Vilsack said. "They, too, need to work with farmers. They need to figure out ways in which they can restructure these loans…Allow these folks who can make it, who can show you a cash flow that makes sense over the course of the next several years, allow them to stay in business." About an hour into the forum, Denise O’Brien — a Democrat who ran unsuccessfully for state ag secretary in 2006 — brought up the issue of health care reform. "One of the things which is such a point of contention now all over the United States is the health care issue," she said. "I believe strongly that we have to have a single payer health care system need that will cover people so we don’t have to worry about losing our farms, losing our homes, and that we don’t have to worry about whether or not we can go to the doctor for preventative medicine." Vilsack did not advocate a specific approach to resolving the issue. "There’s lots of debate about what the answer is, but I’ll tell you the one answer that ought not to be acceptable to anybody regardless of what your position is on all of this is: maintaining the status quo," Vilsack said. "…We have got to reform health care in this country. Rural America really comes out on the short end of a very long stick under the current health care system." Vilsack told the crowd 23 percent of people who live in communities with less than 2500 residents do not have insurance and that’s why health care reform is crucial for rural Iowa and rural America. Click on the audio links below to listen to the numerous introductions of Vilsack, Vilsack’s opening remarks to the crowd, and then the nearly hour-long question-and-answer session with the crowd.